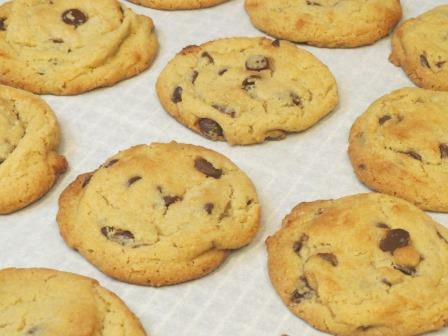 I was forced – forced, I tell you – to bake chocolate chip cookies. They were calling out to me from the ether, or my subconscious, or the Internet, which is more likely. These were pretty good. The recipe is from Danielle Walker’s “Against All Grain” – you can find the post about it here. I wouldn’t go so far as to say that they are indistinguishable from the original, white-flour-and-butter recipe, but they’re certainly quite edible. I also got to try out a new toy. We picked this up at Restaurant Depot a few weeks back. 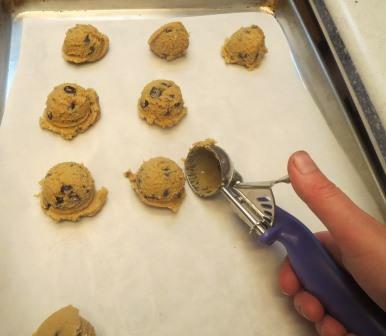 It is The Bomb when it comes to scooping cookie dough. I’ve been making cookies without it for more than 20 years, and I do not want to go back to my pre-scoop dark ages ever again. I decided I needed a side by side comparison of the GF/DF recipe with the original, for taste comparison. Then I decided I ought to mess with my original recipe. Which, I know, invalidates the whole scientific purpose of a comparison study of new-versus-original, but it was after 10 PM at that point, and hey, it’s just cookies, right? My original comes from the 1963 Betty Crocker “Cooky Book“. My mom had this book in her recipe cabinet when I was growing up. She wouldn’t let me kidnap it when I moved out, either. When Betty Crocker decided to re-release it, (something about used versions making beoucoup bucks on eBay), I snatched up a copy so fast that the ink hadn’t dried yet, metaphorically speaking in an Amazon preorder kind of way. The original recipe calls for half shortening, half butter. I hate shortening, so I’ve been using all butter for years now. This results in a flat, but incredibly tasty cookie. The thought crossed my mind as I looked at the recipe… what about half lard? Since I, you know. Have lard. In the freezer. I’ve taught two hog farmers how to render lard, did you know? True story. Anyway. Off to the freezer to find the lard. And make cookies. They are pretty good. I’ll probably stick with all-butter, since the lard definitely has its own flavor and rather overpowers the butter. Not in a bad way… just different. They’re quite tasty. 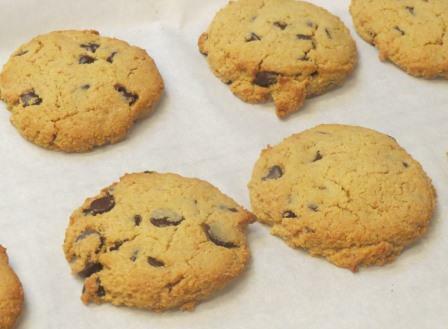 This entry was posted in Allergy-Friendly, Baking and tagged chocolate chip cookies, chocolate chip cookies with lard, cookie scoop, DF chocolate chip cookies, GF chocolate chip cookies, GF DF chocolate chip cookies. Bookmark the permalink.